The following sections provide an overview of the features mosaik currently provides. You can also take a look at mosaik’s history to follow its evolution. init – Initialize the simulator. create – Create model instances. step – Perform a simulation step based on some input data for a time interval. get_data – Get data from the simulator. get_progress – Get the current simulation progress in percent. get_related_entities – Get a list of entities related to another entity (to allow traversing the simulated topology). get_data – Retrieve data from another simulator. set_data – Set input data for another simulator. Based on plain network sockets with JSON encoded messages. Implementations for other languages will be added on demand. Scenario description in pure Python leveraging its simple syntax and great flexibility to support from a few up to tens of thousands entities. You just start a simulator and get a model factory. You use that factory to create model instances (entities). You connect the entities with others. You run simulation. Done. Connection entities is based on a single primitive called connect. It only connects two entities with each other but can be used as a building block to implement any connection strategy for sets of entities that you can imagine. Mosaik can connect to an already running instance of a simulator. Based on the established SimPy simulation library. Simulators can have different and varying step sizes. They only need to agree on a common unit of time (e.g., seconds). mosaik-web is a web visualization for mosaik simulations. 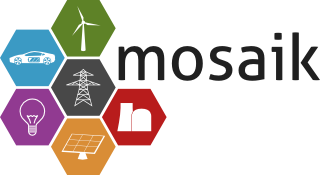 mosaik-pypower is an adapter for the PYPOWER load flow analysis library. .
mosaik-csv and mosaik-householdsim are simple demo simulators that you can use to "simulate" CSV data sets and load-profile based households. There is a repository containing a simple demo scenario for mosaik. .